This classic French dish is often referred to as Niçoise pizza. Its thin bread base is similar to focaccia and the sweetness of the caramelised onions contrasts beautifully with the salty anchovies and small local olives (also known as Ligurian olives as the Italian border is only about 40 minutes’ drive along the coast). The name comes from pissalat (‘salted fish’ in the Niçoise dialect), a puree of anchovies and olive oil flavoured with cloves, thyme, bay and pepper which was traditionally brushed over the topping. If you don’t like anchovies, substitute thin strips of roasted red capsicum, and if you’re short on time use ready-made shortcrust pastry as the base cooked for a little longer at 220°C (the bread dough is better though). As for a wine, I love the Lady A, an unusual oak-aged sauvignon blanc (in the style of French fumé blanc) from Domaine A in Tasmania – slightly smoky and creamy with refreshing citrus notes. Make Dough: dissolve yeast in water and set aside for 15 minutes. Sift flour and salt into the bowl of an electric mixer fitted with a dough hook. Add yeast mixture and oil to the flour and mix for about 10 minutes to form a smooth, slightly sticky dough. Form into a ball, roll in oil, cover and set aside for an hour or so until doubled in size. Meanwhile, heat oil in a frying pan, add onion, garlic, thyme, bay leaf, salt and pepper. Cover and cook over a low heat for about 50 minutes, stirring often, until very soft; if it starts to stick too much add a splash of water. Uncover and continue cooking for a further 10 minutes or so, until lightly golden. Remove bay leaf. Roll dough out, on a lightly floured surface, to form two 35cm x 25cm rectangles. 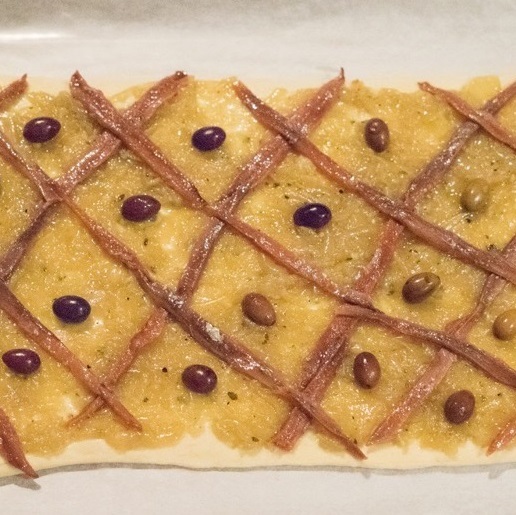 Place on separate baking paper-lined baking trays, spread onion mixture over the dough, then arrange anchovies in a cross-hatch pattern to form diamonds and place an olive in the centre of each diamond. Bake for 15-20 minutes until dough is golden; remove from the tray for the last few minutes to help brown the base.